We all know the story of Rahab in the Bible, albeit a short story at best. Who hasn’t wondered about more of her story? I know that when I recount the lineage of Jesus each Christmas, I continue to wonder why the three women in the linear are there? Why only three? Why those three? What is God teaching us in their stories’? Jill Eileen Smith gives us a backstory for Rahab the prostitute, even though much of it is supposition, because we really don’t know what happened. However, the tale she tells is a good one. This was a hard story to read though, as Ms. Smith’s version puts Rahab as a prostitute against her will. It is a difficult story to follow as Rahab over and over is faced with cruel men taking charge of her life, and quite honestly it is painful to watch. I really enjoyed The Crimson Cord, the end brought me to tears more than once as Rahab is coming to terms with forgiveness through the One true God. Even though I am not a prostitute or at the end of bad choices forced on me, I need forgiveness, I need cleansing too. I loved how Rahab mourned for the lamb that was sacrificed for her sins. We should all feel that intimate pain for the Lamb – as Jesus was sacrificed for my sins. One of the other parts I really enjoyed in this novel was that Ms. Smith went beyond Rahab’s story and was quite true to the book of Joshua. I appreciated how she wove in the defeat at AI, as well as the treaty with the men deceiving the Israelites. I applaud Ms. Smith for a well written novel, even one that was hard to read at times because of the subject matter. I feel like she approached the subject delicately (as she could) and wrote a book that will resonate forgiveness to all of us. 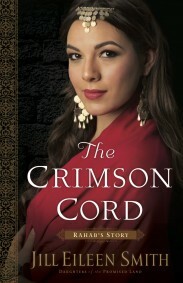 NOTE : I received a copy of the Crimson Cord in exchange for an honest review from Revell Publishers.